As we all know Summer brings a lot of skin problems along with it. One of the major problems which people face is Fungal Infection. 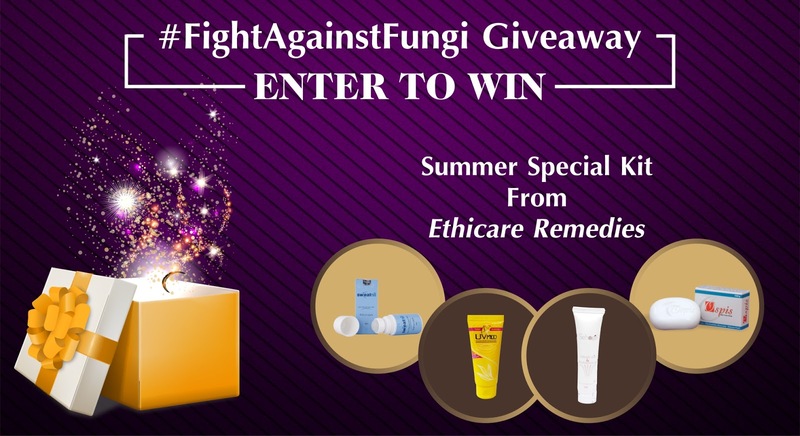 So Ethinext Pharma has initiated one campaign named Fights Against Fungi. In that, they are trying to spread awareness regarding how to prevent fungal infection and how one can get rid of it. You can see it on their social media posts. Also, they have taken an initiative of one more social cause to pay back to society in association with Pratham Council for Vulnerable Children. We will donate Rs. 2/- against each unit sale of any anti-fungal product of Ethinext Pharma. They have also shared a video to spread the awareness regarding the Fights Against Fungi. Below is the video. The Giveaway rules are as always listed in the Rafflecopter widget and other rules are mentioned below so make sure you go through them. Check the winner names in the widget. Winners are requested to DM me their postal address on Instagram within 48 hours of this announcement. 1) Giveaway runs for 10 days from 3rd June 20107 to 12th June 2017. Giveaway open to Indian residential addresses where the hamper can be couriered. 2) We will be having 2 (two) winners. The giveaway is a sponsored one from Ethicare Remedies. 3) Plus hate comments, hate Instagram DM, rude behavior will get you blocked. Unfollowing and/or unsubscribing, in this case you will be barred from future giveaways. 4) Winner Decision will be final by Ethicare Remedies team. 5) Participants please refrain from saying 'Make me win'. It is just a matter of hard work but coupled with Luck :). 6) Winner announcement will take place on Blog, Facebook and Instagram. Winner has to get back via email within 48 hours of winner announcement else another winner will be chosen.